Blueberry Pie Cookies let you have blueberry PIE even though we’re into COOKIE season. Pie season is NOT over yet! You’ll love this easy cookie recipe! Ugh, you guys. My credit card hurts. If it was a person, it would be battered and bruised. Black Friday and Cyber Monday and all the shopping got the better of me, I think. There’s just something about a sale, you know? All the big font screaming 50% off! 25% savings! Free Shipping! gets me every time. A coupon comes in the mail and I literally get giddy. I don’t even want to look at my online credit card statement. I’ll think I’m done shopping…and another email will show up. Entire store on sale!! Doorbusters!! And I’m sunk. I literally have 5 things in my Groupdealz cart. I don’t even like most of the stuff on Groupdealz! But guess what? I decided that I still want to make pie in December. (What can I say? I’m a rebel.) But instead of making a traditional pie, I’m making PIE COOKIES. 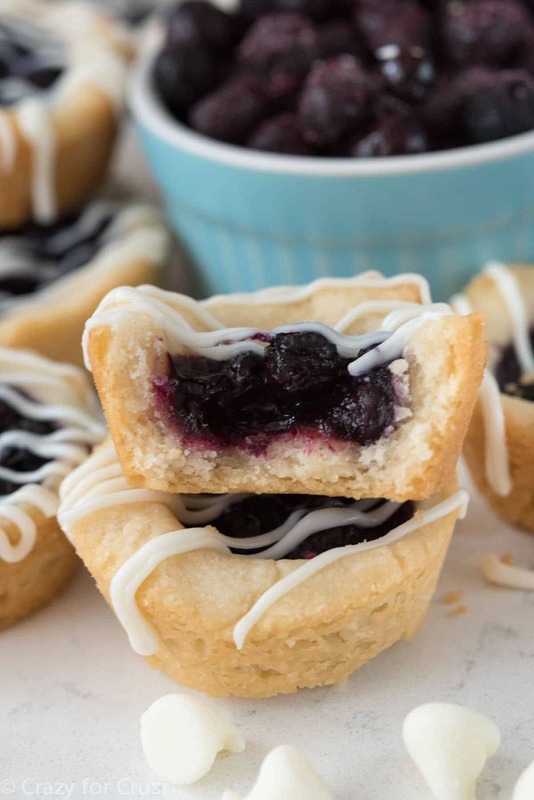 Now, one of my favorite pies (blueberry) can be made into a Blueberry Pie Cookie: a shortbread cookie crust filled with blueberry pie filling and topped with white chocolate. If these don’t scream cookie season, I don’t know what does! These cookies start with my favorite shortbread cookie dough. It’s a soft buttery dough that’s perfect for making cookie cups with. You simply press the dough into the bottom and up the sides of a mini muffin pan, creating a crust. Then you fill it with a homemade blueberry pie filling. 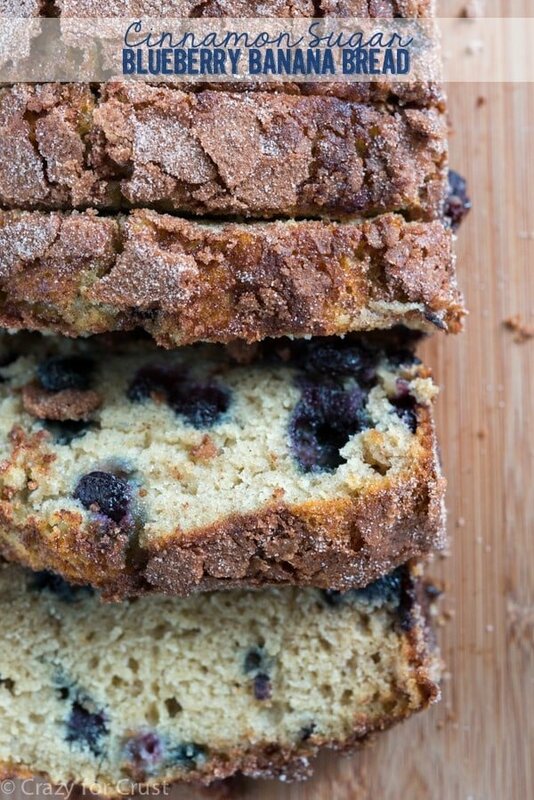 If you remember from other blueberry recipes I’ve made, my family prefers the “mini” blueberries in our baked goods. The technical term for these small blueberries is “wild”. 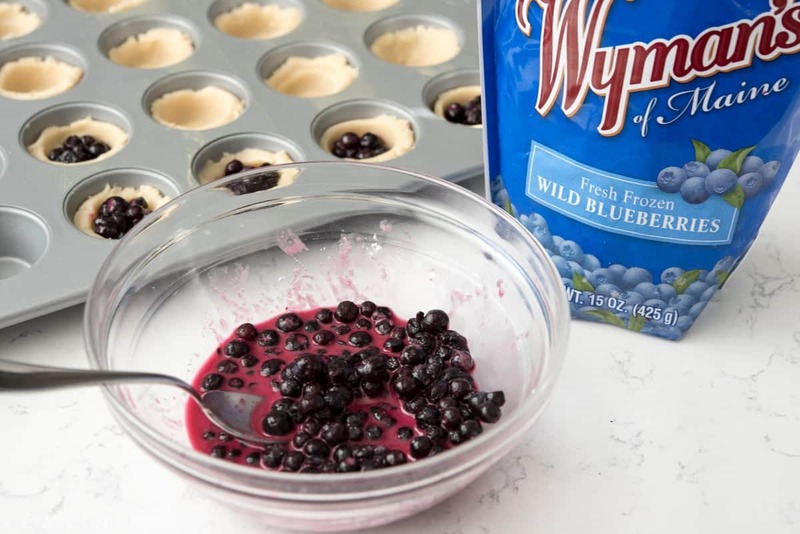 Whenever I make baked oatmeal, cinnamon rolls, or baked pancakes, I always use these wild blueberries, which is why I’m excited to be working with Wyman’s of Maine for this post. Wyman’s of Maine is the largest U.S. owned wild blueberry grower. All their fresh fruit is individually quick frozen to lock in the fresh fruit flavor. Plus – they’re mini! These wild blueberries are perfect for making Blueberry Pie Cookies because they fit into the shortbread crust perfectly. 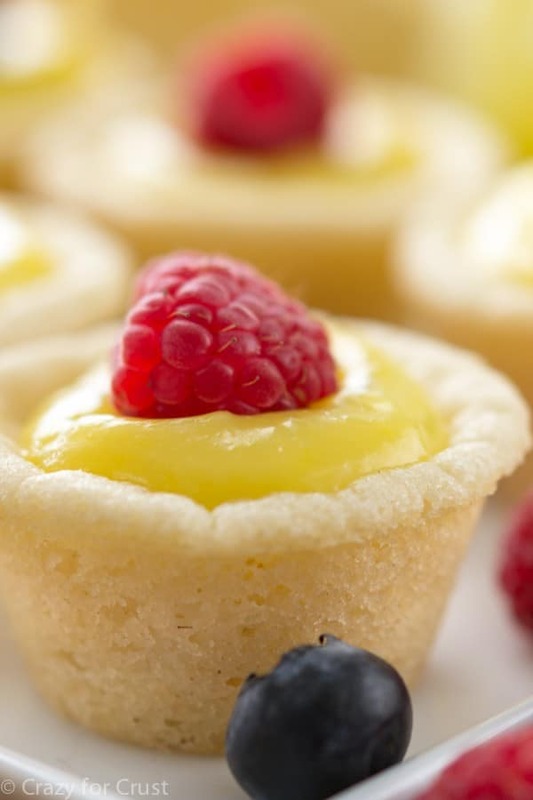 The berries are tossed with cornstarch, sugar, and lemon before they’re added to the crusts. They bake up in the oven just like pie, and once they’re cooled I drizzled them with white chocolate for garnish. 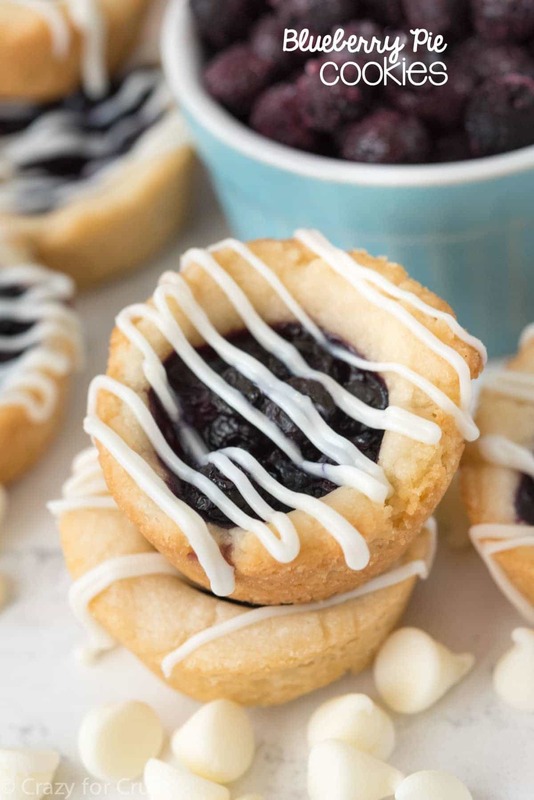 Not only are these blueberry pie cookies better than regular blueberry pie, but they’re pretty, bite sized, and perfect for holiday platters, parties, and gift giving. These EASY Blueberry Pie Cookies are a shortbread cookie filled with blueberry pie and topped with white chocolate. The perfect holiday or anytime cookie! Preheat oven to 350°F. Spray mini muffin pans with floured nonstick cooking spray. Place butter in the bowl of a stand mixer fitted with the paddle attachment. (You can also use a hand mixer.) Beat butter until it’s smooth, then beat in powdered sugar. Beat in vanilla and salt and then slowly mix in flour. Beat until batter forms. Drop 1 tablespoon balls of cookie dough into each mini muffin pan cavity. Press it up the sides of the pan, creating a crust. Drain blueberries well. Toss with sugar, cornstarch, and lemon juice. Evenly divide between the cookies, adding some of the liquid that collects in the bottom of the berry bowl but not too much. Bake for 12-15 minutes, or until the sides start to get golden in color. Cool completely before removing from pan. To top: stir white chocolate chips and vegetable oil in a small microwave safe bowl. Heat on 50% power in 30 second increments, until melted and smooth. Add to a small sandwich bag with the tip cut off and drizzle over cookies. Let set before serving. This post has been sponsored by Wyman’s of Maine. All opinions are 100% my own. Thank you for supporting the brands that make Crazy for Crust possible. Over 100 Christmas Cookies to serve this holiday! Can canned blueberry pie filling be used for this recipe instead of the homemade?